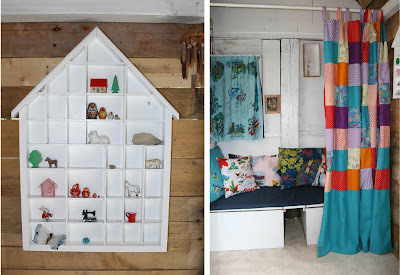 The livingroom, we made a bench with two compartments for storing their toys, the cushions are made from vintage scarfs and we added a patchwork curtain to create a little bedroom. The kitchen, a bright and modern white kitchen with lots of storage for all their pots and pans. Wat een prachtig gordijn, mooie kleurtjes! I'm in love! It's more lovely than I could have ever imagined! I love every detail! I want to move in!! W-A-U-W-I-E! Wat een bofkonten zijn dat... Helemaal leuk! Was de shoot nog goed gegaan, met Henk? Ben superbenieuwd naar jullie huis! Amazing. I want one! All the little details are just lovely. The flowers are so sweet. Your girls I'm sure are in love with their new cubby. That is amazing! I love it. I love your whole blog, I'm so happy I stumbled across it. Wow, every kid would love to have one of those in their backyard! How fun would that be?! That is so adorable! You are the coolest parents ever! Wow these are the cutest things ever!!!!! I love them! You are so clever and have a gorgeous eye! Mooi zeg! Fijne kleuren, goeie stofjes! En wat past er veel in zo'n kleine ruimte!!! Jullie hebben wel erg hard gewerkt zeg! Zijn ze er blij mee? OH MY GOSH!!! 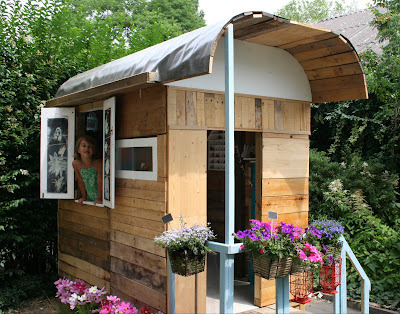 i would have loved to have such a beautiful playhouse like that growing up!!! i love this roulotte !!!!! Absolutely adorable! Any girls DREAM house. Mooi zeg, daar dromen wij ook van. Je kindjes zullen wel in de hemel zijn met hun prachtige huisje. Leuk blog heb je trouwens. Oh my goodness, this is gorgeous! I found you via Maya Made and am so happy I did! This will definitely be going in the 'when I have my dream house folder'. I've added you to my favs so I can keep close tabs on all your beautiful projects! you made an amazing work !!! you have really lucky girls !! I LOVE this playhouse! What a fantastic idea! I will have to convince my husband that we need one in our yard...even though we don't have any children yet! I just stumbled across your blog today. Waar in Nederland zijn u van? (sorry, my Dutch is a little rusty) I spent 3 months living in the small town of Oud Ade, it's near Leiden and Abbenes. I tell my husband every day that I have to take him there! I miss it so much! Anyways, I hope you are doing well! Beautiful! What lucky little girls, I'd love to live here! Reminds me of the playhouse I made out of an old sheep herders camper. It was not near as bright or clean, but I had many happy memories! Ooooh! This is absolutely fabolous!!! What a place to play!!! Love this idea!!! A beautiful piece of gardenart! GEWELDIG!!!! !ik ben ontzettend jaloers op zo'n mooi speelhuis!! Dat is echt fantastisch! Het lijkt me ook geweldig om zoiets aan te kleden en in te richten. Ik hoop dat ze er heel veel plezier mee gaan hebben! this is just so so dreamy. I am really impressed and would love to hang out with your daughters so I can play in there too. this is the most charming place I've ever seen!!! how much fun. Incredible! I found your site through Knack, thanks for sharing. My 8-year-old daughter is drooling and asking when she can have a little house! this is adorable!! 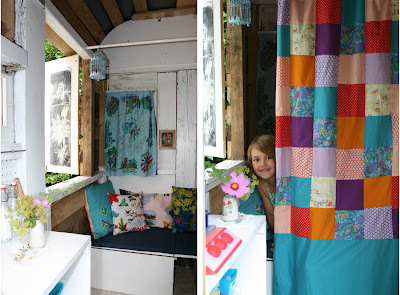 i am in the middle of building a playhouse for my daughter and love that patchwork curtain! Is that something you made, or did you buy it? thanks for sharing!!!!! Wow, dar moet je patent op aanvragen! zeker weten dat iedere meisje zo'n huisje wil! that's adorable! we are goignt o buy a shed/summer house to paint up for H to play in, but we haven't quite got around to it yet. This is such a lovely little hide away. Thank you for sharing your inspiring ideas, what a pleasure to read & see! Best wishes! remarkable. what a haven for little ones!! so lovely! beautiful photos!! found you via "hyggelig".. what a sweet playhouse, one can get envyous ;) really nice, i like it. wow, I'm so impressed and inspired!! Just exquisite...those lucky girls...love all your decorating touches as well! Wow, how visually stimulating! That is the coolest fort/playhouse ever!! Saw this on Knack Studios Blog! Wonderful! I'd love to play in there too! Ohhh, nice to meet you and your blog, love it!!!!!!!!!!!!!!!!!!!!!!!!!!!! Oh, dat ben jij ook, haha! So very playful and and adorable. I would love to join them and have a cup of coffie. Wat wil een kind nog meer! Dit is toch wel zo geweldig...een eigen paleisje! Oh, wow what a place! Such great job! What a little dream to photograph (and play in), wish I where there. your girls are SO lucky. I love all the details and love you put into it. Thank you for sharing it with us! A very nice place to play and dream ! That's so lovely ! What lucky girls. I wish I had such a charming place to play as a little girl. oh my! the nices thing I ever seen! this is the prettiest play house in the whole world! they are so lucky! love your blog and I'm happy to find it! so beautiful!! i should live here!! It's really fabulous ! It's a beautifull dream for girls. Very happy to discorve your blog ! I love the house! and the blog too! What a wonderful little house for your daughters! Have a beautiful summer Erika! I think any child would have a blast playing in your little house. So much thought went into each and every detail. Lovely job! Wonderful playhouse! You did such a good job. Lucky little ones! Oh, my. This has made my cravings for a daughter have increased exponentially. 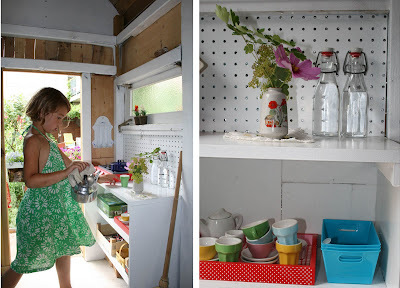 I have a little boy who'd much rather have a custom built garage (or race track), over a playhouse with a mini garden. :) haha. Very beautifully done. Maybe I'll convince my husband to build one for me. 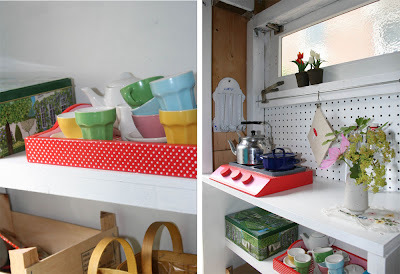 I read about this caravan on another site (maybe AT) weeks ago, and loved it. Glad to find your blog just now through Decor8. 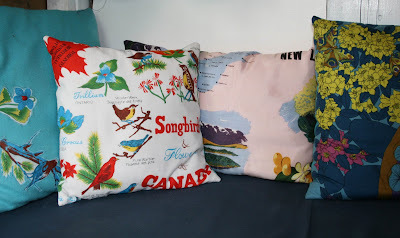 May I ask where you found the Canadian Song Birds fabric for one of the pillows. It is so precious. 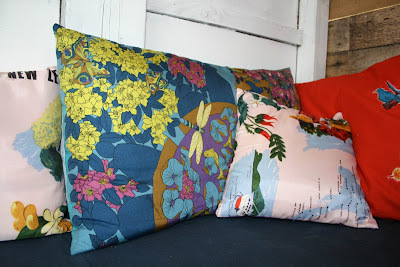 Hi Kareena, the fabric of the pillow is a vintage 'souvenir' scarf I fountd in a seconhand shop! REALLY lovely! I want one for me! I love this. Super cuuute!! This is just wonderful! I'm curious about the size of the playhouse (the dimensions of the floor). Thanks so much for sharing your inspiring project! WOW ... absolutely beautiful ... I want one of my own! Grandioos!! Oh, wat ben ik jaloers op zulke creatieve mensen! 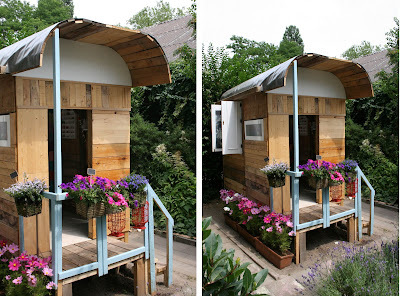 i absolutely adore this little house!!! Please take a look at this site: I just love roulottes and tree houses!!! I love the interesting surfaces the bits and pieces of resycled wood makes. :) Very well done! This is possibly the sweetest thing I have ever seen! So adorable. I want to go out and start building one for my girls! Very inspiring! Ik schrok trouwens een beetje van één foto, waar één van je kinderen half achter het gordijn staat en lachend de camera in kijkt... het leek nl. even alsof ik naar MIJN dochter zat te kijken! M'n vriend zei het ook al... gewoon eng joh.. haha, een dubbelganger dus! Super j'adore votre roulotte !!! Elle est superbe !! pouvez-vous me dire quellessont les dimensions ?? Magical right out of a fairytale! I am 75 years young and would love a chance to play, dream, read and listen to rain on the roof cuddling with my teddy bears. I really want the same one (little bigger)for me& my family!! !